• Custom Nodes - build your own modules! • Timing mode - figure out which nodes are using the most CPU! - Fix for Bluetooth headphones. - Unit Delay now works feed-forward. With respect, I am clearly not gifted with the resource for this program. It is beautiful, intriguing, complex and challenging. I have read the admiring reviews and watched the incredible “demonstrations.” I have read the “instructions.” But, truly, I can do absolutely nothing with this program. As I started to work with this relatively expensive program I seriously wondered if it was in fact some kind of complex “put on.” Clearly it must not be given the affectionate comments and reviews. Nevertheless, I believe the enthusiasms of the gifted with this program may be preventing a simpler orientation and frankly simpler instructions. Simple instructions on how to make the first entry into this program may exist, but I have looked and can find nothing that tells me to connect this to that to get a claw hold. I would be so excited if I were able to soar and sweep through this incredible program. I cannot do even the most simple thing and while I will take considerable credit for not being smart enough to do anything with this, I am sad, only for petty financial reasons that I bought it. Nevertheless, if a test person is needed to read, try and comment on updated, simplified, workable instructions I am more than willing to volunteer. It would be wonder to experience the strengths of this incredible but inaccessible to me program. 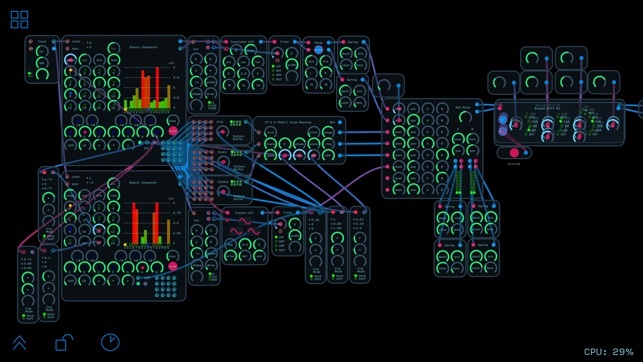 If you have every been interested in modular synthesis or electronic music creation, Audulus is the app for you. 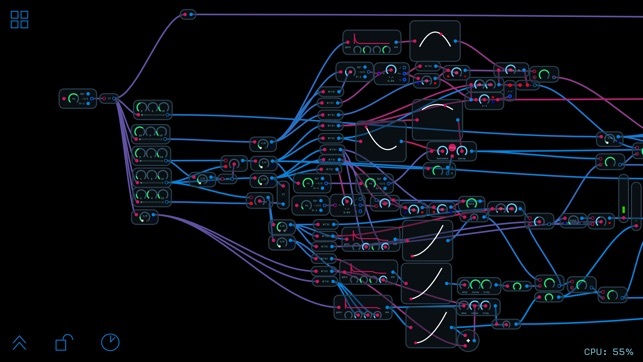 Far more than a “soft” synth, Audulus offers a rich visual programming environment for sound creation and manipulation. 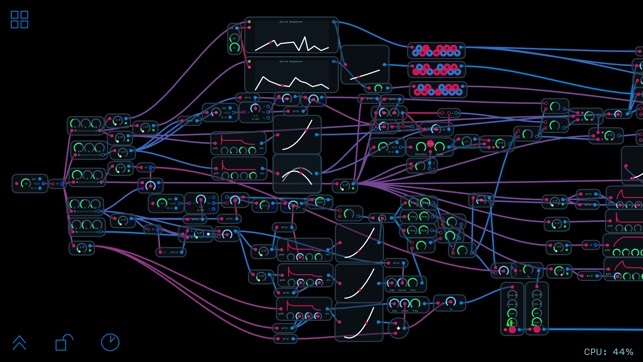 With a large selection of fundamental building blocks and a wide variety of prebuilt modules including example patches and full synths, Audulus allows you to create almost anything you can imagine. With multichannel IO support, MIDI, IAA and Audiobus compatibility, it can interoperate with other iOS music apps and with a suitable interface can also connect to more traditional hardware synthesizers. It’s available for iOS, macOS and Windows and patches can be shared between platforms. The 3.5 release features a new patch browser integrated with the iOS 11 Files app for simple patch management and sharing. The app has an active user forum where users can share ideas, patches, and assistance and there are several very good tutorials available on the forum to help get you started. Thanks so much HammerDulcimer! 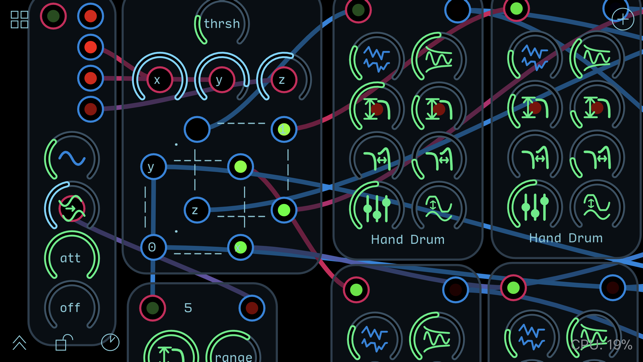 Glad to see you're really getting the most out of Audulus - especially the forum :) We have so many great new updates coming along with 3.5, including lots of new patches that were developed first on the forum. Thanks again! I've had Audulus since early 2013 and it should be considered "Legendary" in the iOS synth world. Without a doubt, the best tool to learn and build synthesis engines. It certainly isn't your run-of-the-mill canned synthesizer (you must do a little work to make it go "beep"), but once you've learned some of the basics, the capability depth is unlimited. 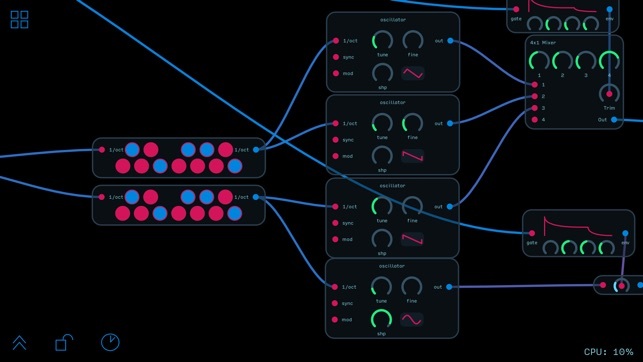 Audulus is well supported (check out the forum discussions, tutorials, and recorded live streams) and the developers and user-community are more than happy to answer any questions. You won't be disappointed. Update (24 Jan 2018) - This latest update (V3.5) significantly improves the usability of the patch library taking advantage of the new iOS 11 Files browser. Update (3 Apr 2018) - Another sweet update (v3.5.1) and the module library keeps getting better! Love the embedded documentation in the modules. Looking forward to seeing the Midi overhaul in another (hopefully soon) update as well as an updated Windows version supporting the SVG icons! Aw thank you so much BDB-1958! Glad you think so highly of us, and thank you for updating your review for 3.5 - pleased you're enjoying that as well. We're going to have some new patches coming your way soon - over 500! - in the next little iOS update. Stay tuned!